Set in the picturesque village of Randwick in the heart of the Cotswolds the Vine Tree Pub offers a warm welcome to all in need of good food, good ale and great company. 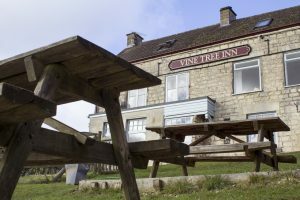 The Vine Tree, close to the famous Cotswold Way, is the centre of village life for the locals and and a haven for the weary traveller. On a typical evening you will find the pub full with a wide variety of customers, you may find one of the local clubs or organisations in the corner having a meeting, the pub darts team in mid game, a lone dog walker enjoying a sneaky pint (dog in tow) and the restaurant full of people who have come far and wide to sample the fine foods the Vine Tree has to offer, all home cooked. On a fine day you can enjoy the tiered beer garden with its glorious views of the five valleys down into Stroud and across to Rodborough and Selsley Common, and on a cold winters day you are invited to come in and warm yourself by the real wood fire. Whatever your reason for visiting the Vine Tree Randwick you can be sure of a warm welcome not only from Lajos & Jana the pubs landlords but from the regular customers who frequent the pub.